Plan vacation or business trip with eTravel.com and take advantage of cheap rates on flights booking, airline tickets, and lowest airfares for Las Vegas. 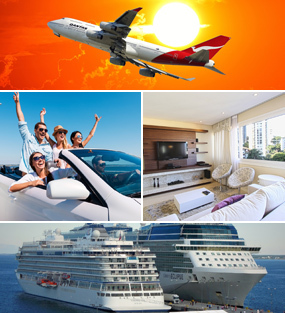 Search cheap flights to Las Vegas, find and book single or multi-city destination flights. On this page we give you information and glimpse of visiting places in Las Vegas, Nevada, United States. Las Vegas is the most exciting city in the whole of the US and the biggest city in the state of Nevada. The glorious city is located in the desert among the barren hills. But within the city everything flourishes. Las Vegas springs to life during the night with sparkling lights and fountains, clubs and casinos and people from all over looking to have fun. But when day light hits the city it is transformed into a culture center and the ultimate place for relaxation. Travel deals are extremely easy to find in Las Vegas all year round. But to beat the extreme desert temperatures the best time to come to Las Vegas is during the Spring time from March to May and Fall from September to November. During summer, temperatures can jump up to a hundred degrees, which makes the winter months from December to February a major tourist season in the city. How to Save When on a Las Vegas Tour? If you would like to experience the Las Vegas buffet, try it out during lunch time. It is much cheaper and has the same food as the nighttime buffet. Casino food courts and buffets are much economical than the Las Vegas restaurants. So make sure you check them out. To save money on travel within the city, walk it out or take the Las Vegas Casino Shuttle or the Vegas Monorail. Book your show tickets online it will be much cheaper and can also entail discount offers.